As Delinquent Habits’ only Spanish-fluent MC, Kemo spent twelve years with the group, releasing four albums and taking the Delinquent sound beyond borders and around the world. In 1996 the group struck gold with their very first single “Tres Delinquentes”, a song that masterfully fused a traditional mariachi sound (courtesy of Herb Alpert’s “Lonely Bull”) with the raw hip-hop backdrop of the streets. The sound was a breath of fresh air in a stale rap scene, and opened a new creative doorway into which many other Latin hip hop acts would follow, including Control Machete, Pitbull, Akwid, and Crooked Stilo. Four Delinquent Habits albums later – after countless tours around the globe including the UK, Europe, Japan, South America, Mexico and Taiwan – Kemo decided to leave the group in 2004 and embarked upon his solo career. The move allowed him to record ‘Simple Plan,’ the solo album that many DH fans had been asking of Kemo for several years. 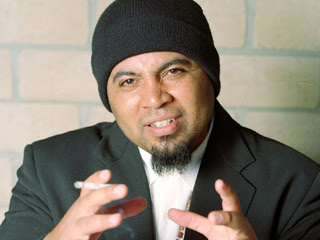 Risky but necessary, Kemo walked away having played a major role in solidifying Delinquent Habits as one of the most influential Latin hip-hop groups of all time and establishing himself as one of today’s top Latino MC’s.